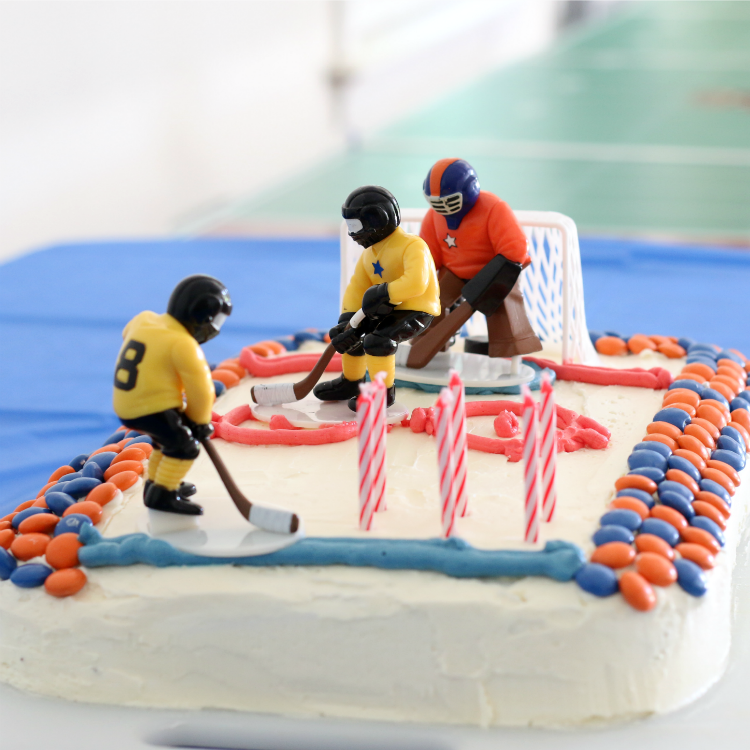 Invite your kids to join you in the kitchen to bake their own sports-themed birthday cake. It’s easier than you think. You can definitely do it, and it’s a great way to introduce kids to the kitchen. 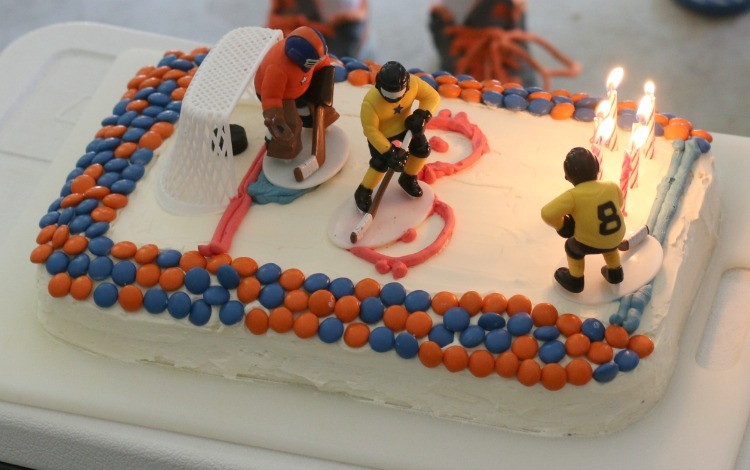 Have you seen those ridiculous sports-themed birthday cakes on Pinterest that are so perfect you wonder who took the time to make it and how the heck they pulled it together? For the longest time, we assumed a birthday cake any fancier than a thin layer of crumb-filled frosting was reserved for the experts. We could never make something like that?! Traditional store bought cakes, though, tend to have too much frosting that’s way too sweet. Also, many kids love popping in the kitchen to help bake. After finding a cake recipe we really liked that made great cupcakes, we decided to make a hockey birthday cake for our son for his upcoming birthday party. It didn’t take long to find a few simple but perfect hockey player cake decorations (like this set of players and this helmet and pucks set). Our son had some grand ideas about what he wanted, including three dimensional stands and lots of layers. Yep… nope…not happening here. A quick Pinterest search landed on a standard rectangular shape cake (easy enough), with white frosting (manageable), a few simple lines (made possible by a dessert decorator), and colored M&Ms as fans in the arena. We didn’t strive for perfection or anything grandiose, but our son got to design, make, and decorate his own birthday cake. He was thrilled. Don’t worry. You can totally do this. We’ve got a few tips from our own experience that should make your cake baking experience a breeze. 1. Embrace the Mess ~ Baking with children is undoubtedly messier than going at it alone. Plan on a little flour and sugar on the counters and floors. After the baking, have the kids help clean up. It’s all part of the process. 2. Measure Over Extra Bowls ~ To reduce the mess a little, children can measure ingredients over a separate large bowl so excess falls into the bowl and not all over your counter. 3. Use Containers With Large Openings ~ Store ingredients like flour and sugar in large cylindrical jars with big openings, so kids can work over the containers and the extra ingredients end up right back in the container. 4. Let Them Measure, Pour & Stir ~ Toddlers and preschoolers might be too young to measure ingredients themselves (although you’d be surprised what kids can do when given a little trust and guidance). Around 4 or 5, many children can measure basic ingredients like flour, sugar, baking soda, and vanilla. Use these opportunities to introduce counting, spatial considerations like “full” and “empty”, discussion of addition and fractions, and more. For example, many young children won’t properly fill a measuring cup when adding ingredients. They’ll dig in to the container of flour, grab a bit, and get excited to pour when the measuring cup is half full. This is a great opportunity to explain the cup is only half full and help them fill it all the way to the top. Offering a spoon so they can fill up the cup may be useful too. When the recipe calls for 3/4 cups of an ingredient, it’s a great opportunity to reinforce counting to three with your children. Sometimes, it’s easier for children to use smaller tools, so encourage children to add two 1/2 cups of something instead of one full cup. Not only does this make it easier for them to contribute, but you also have a chance to talk about how two halves is the same as one whole. 5. Cracking Eggs ~ Very young children will not have much luck cracking eggs. But even children as young as 5 or 6 can crack eggs. It’s best practice to crack an egg in a separate small bowl before adding it to your ingredients anyway, so follow this trick and you can always pick out any eggshells before adding to the mixing bowl. 6. Bake The Cake In Advance ~ Frosting a warm (or even remotely warm cake) won’t work. The cake crumbles to pieces (trust me… we’ve tried). After letting the cake cool for an hour or so, leave it in the pan, cover it with plastic wrap or place in an airtight container, and leave it in the fridge. You can bake it up to a couple of days in advance, which is nice because it reduces the amount of work to do on the day of the party. 8. Invest in a Dessert Decorator ~ Professionals may use frosting bags and at-home baking gurus have mastered the art of frosting with plastic bags. Bag those alternatives (pun intended), and add a dessert decorator to your collection of kitchen tools. It’s not particularly expensive and makes frosting a cake so. much. easier! Even elementary school children can help with this tool. 9. Use a Knife to Sketch the Design ~ We took on enough of an adventure decorating our own cake, so we stuck to a relatively simple design comprised almost entirely of straight, flat lines. Aside from simple half circles for the goalie crease, we steered clear or fancy frosting design. 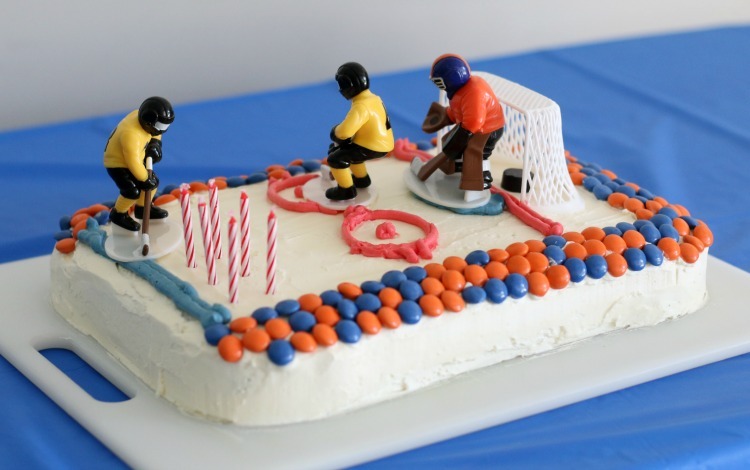 When it comes to sports cakes, most of the fields have straight lines anyway, so don’t let the decorating deter you. The dessert decorator was hugely helpful here, and drawing the lines proved one of the least technical aspects of the cake preparation. 10. Rely on Pre-made Decorations for Finishing Touches ~ There’s no shame in heading to Amazon or your local kitchen or cake decorating store to find figurines or equipment to provide most of the thematic elements. Micheal’s has a decent selection of cake decorating materials. You could also use sports figurines from the toy section of a store like Target. With these alternatives, we eliminated having to draw sports shapes or use more difficult techniques to achieve our theme. Baking provides a great opportunity to spend time together, be creative, and also exercise math and science muscles. In the kitchen, kids practice fractions, addition, spatial concepts and other math matters. They also begin to experiment with chemical reactions of mixing ingredients like butter and sugar expanding significantly under the fast motion of a mixer. They can see how heat changes the form and size of matter when their wet batter rises and transforms into a dry cake simply by sitting in a hot oven. There’s so much to be learned sharing time with our kids in the kitchen. They also have a wonderful opportunity to experience the gratification of dressing a vision of their cake and watching it come to fruition. 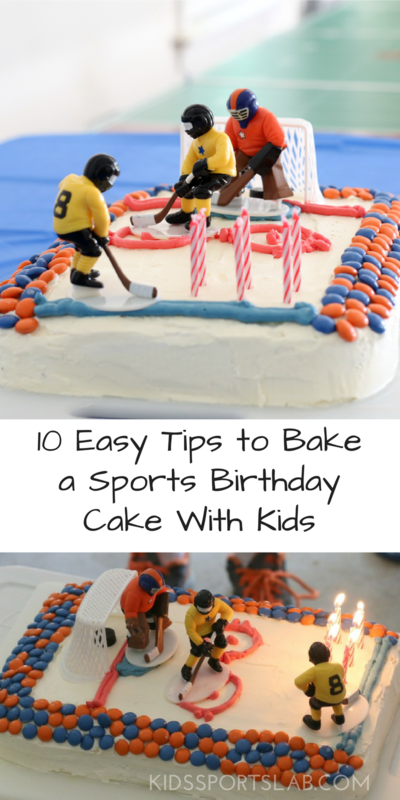 No matter your cake baking experience, you can definitely make a sports-themed cake with your children. Even if you feel most comfortable starting with a cake from a box, it’s a great activity to do with children. If you try it, be sure to share it on social media and tag @kidssportslab with hashtag #SmartsForSportyPants so we can check it out. We can’t wait to see what you create! !